The San Francisco rental market continued to be the most expensive rental market in the country, reaching an all-time high of $3,460 for a 1-bedroom apartment. While prices in New York City remained largely flat at $3,000 last month, SF continued upwards, increasing 1.5% month over month and 3.3% over the last quarter. 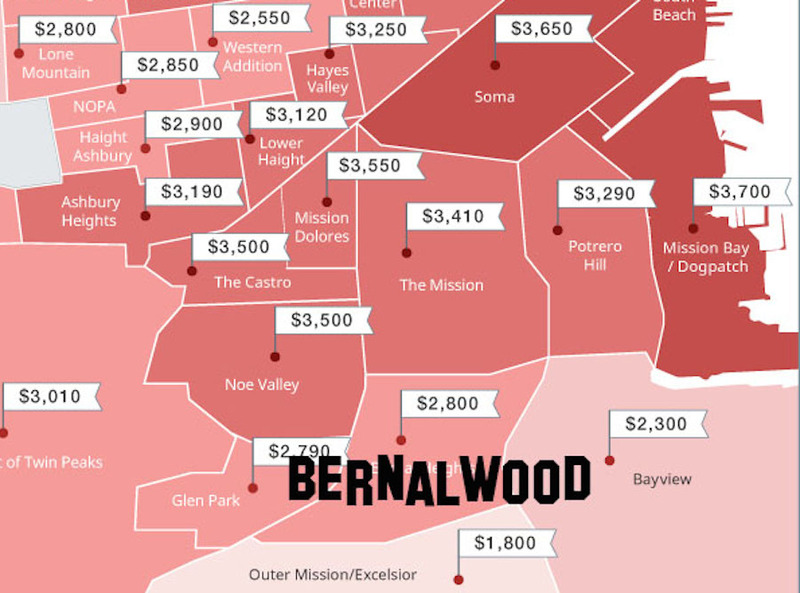 That said, rental prices in Bernal are on the low-crazy side of totally insane, relative to many neighborhoods around us. ← Ask Bernalwood: Is Stealing from Recycling Bins OK? Is Precita Park On-Leash? I’m surprised that Bayview 1 BR rent is so much more expensive than the Excelsior. Anyone have a theory to explain the disparity? I suspect the somewhat better public transit coverage (e.g. the T line) plays a part. I’ll buy that, at least for part of the delta. The Excelsior doesn’t have a blog. Or Cal Train. Or much in the way of MUNI tram service. Or city services in general. Would be great to get a quantitative analysis on how a blog can drive up rent. Time to pivot! I’d like to ask why you are surprised. If my last 20 years were rebooted today, I’d be all over Bayview looking. Stunning views from hilltops. Highest percentage home-ownership in SF. Warm weather. Already gentrifying. Close to transit and freeways. Multi-generational familial housing. Large yards. If I’m not mistaken, isn’t one of the hilltops with stunning views taken up by a large swath of public housing which is generally considered undesirable (from housing appreciation standpoint)? Very good point. 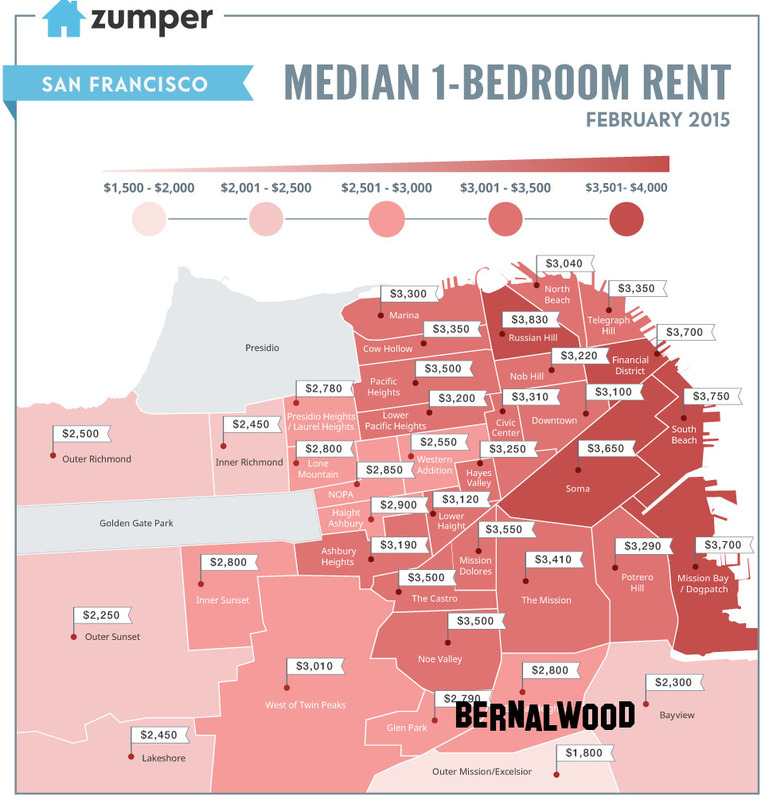 I may need to mention that I moved to my Bernal home to live, not as an investment. Appreciation is not relevant. Small sample sizes of vacancies in particular neighborhoods could also be bending the numbers. It’s still truthful, it’s just not representative of what people are currently paying. For example, 95% of the 40ish listings in Dogpatch are new construction or lofts, and a similar story in BV/HP, where aside from a loft on 3rd st, the only 1-bedrooms for rent are all in a single new development near Candlestick called “The Ashton.” The Excelsior is more likely to have 1-bedrooms as inlaw units or in older buildings, not to mention the bedrooms listed in a shared living situation (which shouldn’t be listed in that section, but often are). With your persistent fawning over Bernal and touting it as the most super fantastic awesome much loved perfect place to live in the entire universe, are you now surprised by how high rents are here? I find the attempts to be cute on this blog to get tiresome and questionable (see my comment below). Why do you hate super fantastic awesome much loved perefect place to live in the entire universe so much? I love Bernal, and I appreciate your reporting, but I find the degree to which you fawn over the place trying to be cute, to be somewhat evidence that you have an inferiority complex about it. I prefer the reportage that’s not over-the-top cute, which sets my teeth on edge. Your milage may vary (and obviously does – it’s your blog after all). Wow, you attribute quite a lot of influence and power to … a blog. Or are you one of those people who believes that if everyone just holds their tongues, nobody will be aware or smart enough that certain places exist, and that they will, in violation of everything we know about human behavior and migration patterns, remain ever the same as you remember them? You seem worried. Are you worried? Take some deep breaths. No worries at all, just razzing Todd’s degree of “cute” reporting. Same as my comment above: it’s fascinating that a blog can drive up rent. So far there are two votes that think blogs can drive up rent. Assume that only 10% of readers post/respond to blogs, I extrapolate that 20 (2/.10) Bernalwood readers believe blogs can drive up rent. Assume further that only 20% of BH residents are readers of Bernalwood, we now have 100 (20/.2) BH residents that believe blogs drive up rent. Finally, assume 10% of SF citizens are BH residents, we now have 1,000 SF residents that believe blogs drive up rent. That’s not an insignificant number. Crude math, but I forecast rental/real estate listings will use that feature as selling point (“…and it has a blog!”). Perhaps Todd needs to get revenue shares of some sort to compensate for his work in running this blog. If you are suggesting that plenty of local realtors probably owe me some referral fees, well… sure, the thought has crossed my mind. Wait. We are allowed to do engage in activities without “monetizing” them? I just assumed Bernalwood got kickbacks from the Kiddogbikeparkingrentalgentrificationtech Mafia?!? 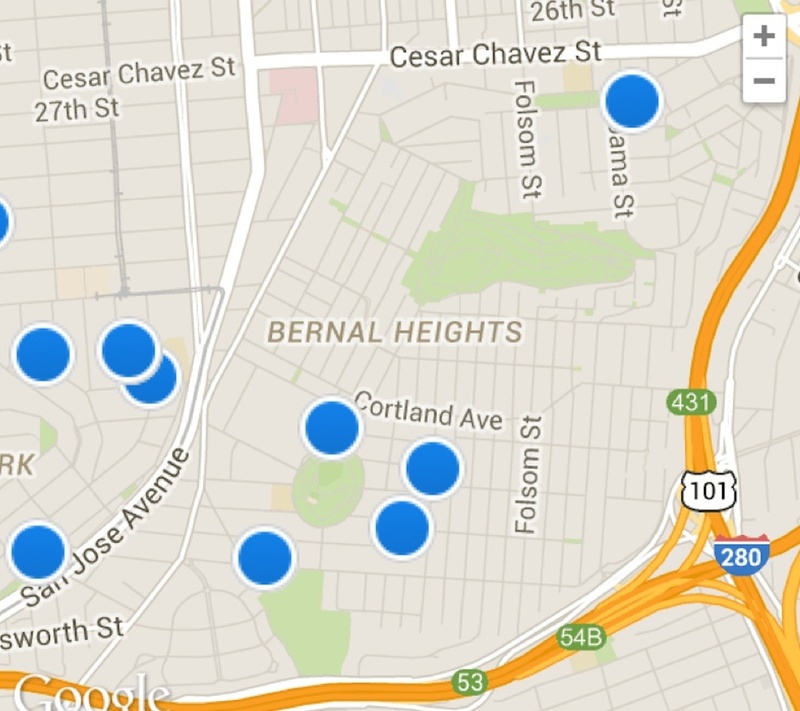 Bernal rents are lower than many neighborhoods with much weaker blogs than Bernalwood. Perhaps a good neighborhood blog lowers home prices? Stay cute Todd and help keep Bernal’s glamour quotient in the ionosphere.